Am y Gymraeg cliciwch yma. South Wales Anarchists will be demonstating in Cardiff to celebrate this years May Day. 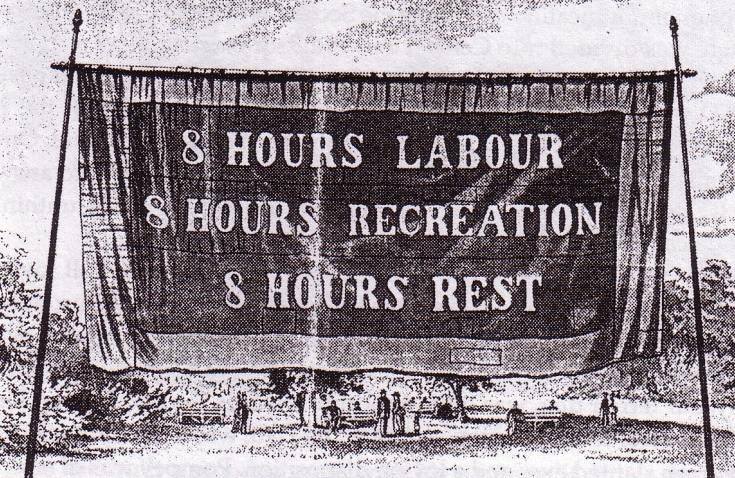 Originally a pagan festival, the modern May Day bank holiday has its roots in the fight for the eight hour day and is celebrated across the globe as an International Workers’ Day to commemorate the anarchist trade union organisers who were executed in Chicago 1887. 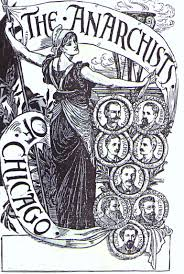 They were framed and wrongly accused of throwing a bomb at police breaking up a crowd in the Haymarket during a demonstration involving over 400,000 working in Chicago on May 4, 1886. The anarchist idea did not die with these workers in 1887 and continues to be the inspiration for many fighting capitalism around the world. We call on all those struggling for a world of justice, dignity and freedom to come together and join us this May Day in Cardiff. Bring your red and black flags and class struggle banners! Meet at 12 noon at the southern end of St Mary St, under the railway bridge near the Great Western Wetherspoons. March starts at 12.30 through the streets of Cardiff City centre to…. somewhere with no bureaucrats’ speeches!!! 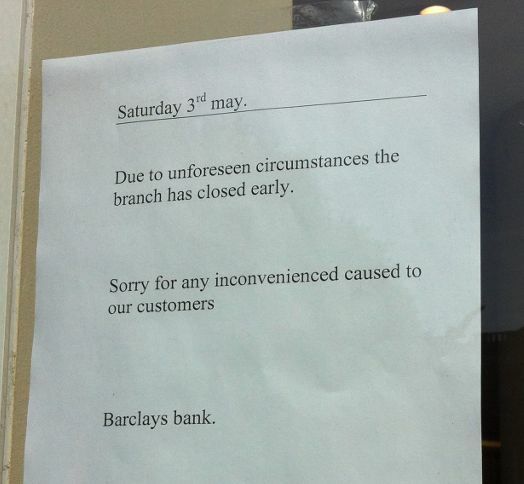 On Saturday, 3rd of May, a group of 25 anarchists and anti-militarists closed Barclays’ Cardiff city centre branch in protest of the bank’s investment in the arms trade. 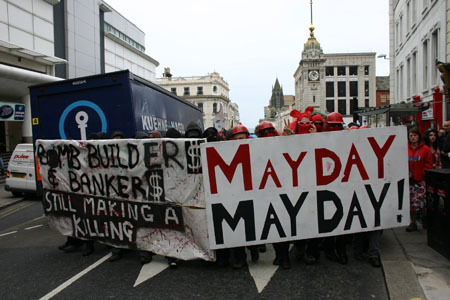 The campaigners formed a Radical Bloc on the Trades Council-organised May Day march, breaking from the main route to take action against the bank instead of going to listen to speeches by union officials at the Trades Council’s rally. A local anarchist and member of the Stop NATO Cymru campaign group said: “We took part in the May Day march to draw attention to the struggles of workers all over the world against exploitation and violent oppression which is exacerbated by arms producers here in the UK. We targeted Barcalys because it’s a major investor in Exelis Inc. the parent company of the EDO Corporation which is guilty of mass-producing arms to sell to oppressive regimes, exacerbating violent conflict and suppressing legitimate protest. Barclays Global Investors UK Holdings Ltd has 5,059,591 shares in Exelis and Barclays PLC has 63,071 shares. The protest was organised by Stop NATO Cymru as part of an ongoing campaign to oppose the forthcoming NATO Summit in Newport this September. May Day is about radicalism. It’s about celebrating working people’s history of fighting for better conditions. It’s about the global struggle against a system which tries to keep us in subservience instead of leading fulfilling and liberated lives. 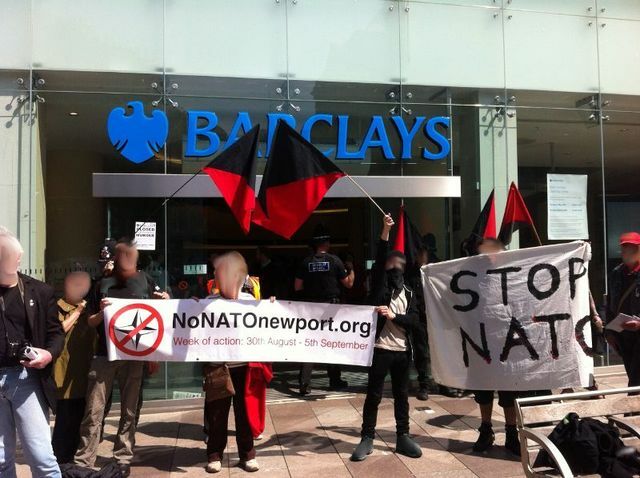 In September NATO is holding a major summit in Newport, gathering some of the world’s wealthiest, most powerful warmongers in an area with a proud history of radical struggle. NATO is the armed wing of capitalism. It exists purely to further the interests of American elites, uniting American puppet-states in bloody wars over oil, political influence and to force their ruthless, “free-market” economics on the entire world. Every year thousands of people are killed for being in the wrong place, on the wrong side of US interests, having the wrong colour skin, or being part of the wrong class. Join us on Sat 3rd May on the Cardiff May Day demo, not to listen to the same old speeches, but to take action against the Military- Industrial Complex, show that building a better world is possible and send a clear warning to NATO that we’re ready to fight back. 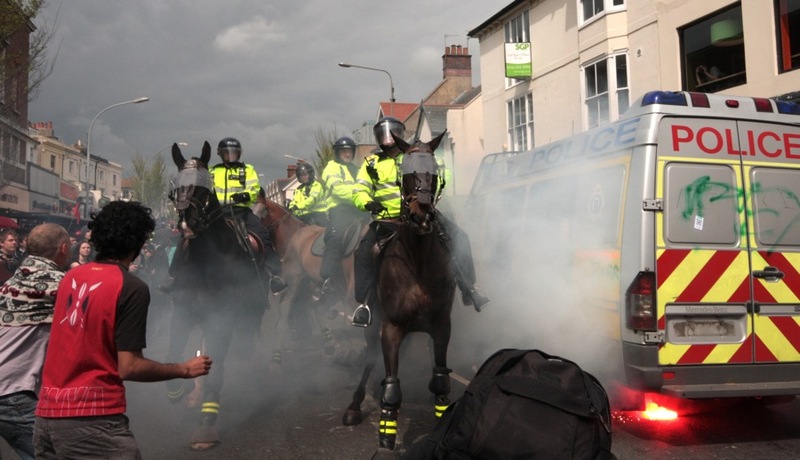 Mayday Mayhem For Police As Summer of Rage Continues! 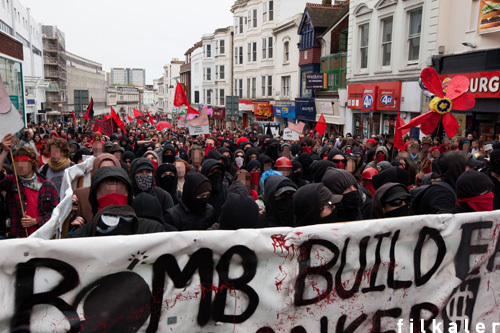 South Wales Anarchists joined up to 2000 people from around the UK in Brighton on May 4th for the largest demonstration to date against Brighton based ‘EDO/MBM’ bomb component factory, organised by Smash EDO. The MayDay Mayday Street Party against war, the arms trade and capitalism was a lively and colourful march that started at Brighton’s sea front. It continued through the town and paid visits to a number of local branches of multi-national corporations, including McDonalds, RBS, HSBC and Lloyds which invest in ITT, the corporation which owns EDO. Activists scaled scaffolding on Barclays bank to drop a banner demanding “arms dealers out of Brighton”. Police paid special attention to protect a branch of McDonalds which proved to be a flash point with a police van nearly being tipped over and a flare set off underneath it. 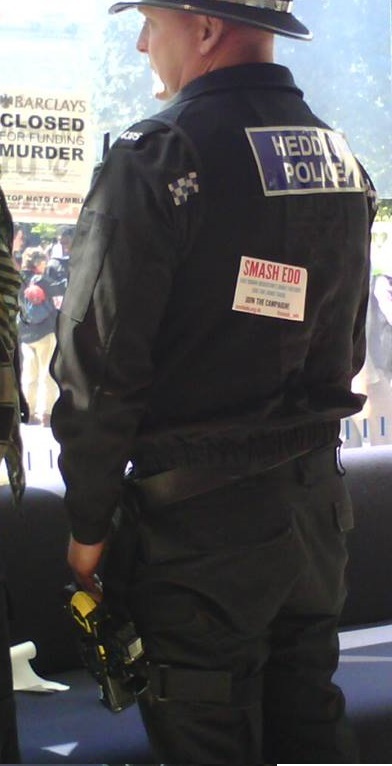 Compared with previous EDO demos, policing was relatively hands-off initially, without the automatic attempt by police to cordon every man, woman, child or dog in sight. However, batons and pepper spray were used on activists during the day as riot police attempted to control the march and activists successfully forced back mounted police a number of times. Of course, the police ‘Forward Intelligence Teams’ were present but were forced to retreat behind police lines as FIT- watching activists made their job of intrusively filming protestors more difficult. 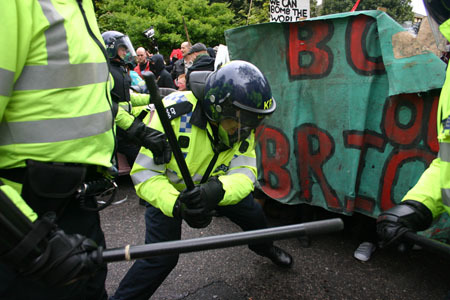 It seemed that many activists had learnt from the G20 protests and refused to be drawn into long fights with the police. Activists instead found alternative routes and kept moving around the streets when unable to break through police lines quickly, outwitting the cops and leaving them stranded waiting for orders. 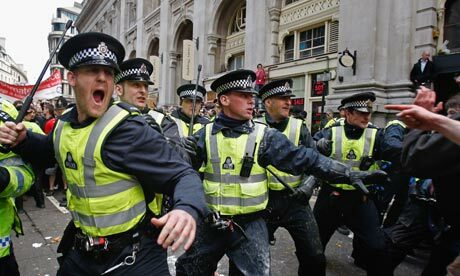 At one point the cops themselves were ‘kettled’ (penned in) thanks to protestors’ quick thinking. The demonstrators’ refusal not to be kettled or subjected to violence by the police meant that officers were often surrounded and outflanked. Towards the evening, as the march appeared to retire to the park by St. Peters church and just as riot police had storm-trooped away, the party took to the streets again taking us all by surprise! The streets were again re-claimed by activists and local young people, running through the streets of Brighton, through the Pavilion and back towards the beach for more partying. Many felt that the police were on the back-foot at this time since the G20 protests and due to the associated bad press officers received for their tactics. While the police may have been aware of the public eye upon them and tried to behave themselves a bit more on this occasion, the fact is that the police continue to protect private corporations who profit from war and death; meeting resistance to this with violence and repression. While slightly less violent and oppressive policing may be an improvement, better still would be no police at all and the complete freedom to shut down EDO and all corporations who are responsible for the continuation of the bloody war machine. Resist police violence! Friday May 1st! We call on everyone angered by the vicious and violent methods of the police force to Protest outside Cardiff central police station on Friday the 1st May, 6.00pm. The police station is on King Edward VII Avenue, just behind city hall. Bring what you expect to find. 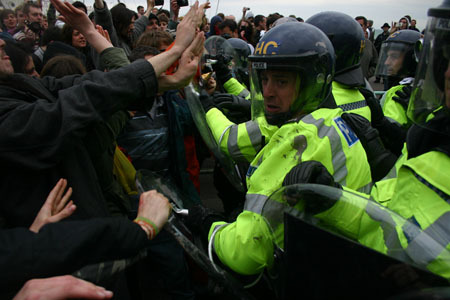 The brutal policing of the G20 that culminated in the death of innocent bystander, Ian Tomlinson was typical of the police force’s response to protests. Tomlinson died after being assaulted by a masked member of the Territorial Support Group (TSG). This was not the only incident of violence on the day and, most certainly, is not an isolated event as anyone who has attended a recent demonstration will attest to. The events at the anti-G20 protests are only the tip of the iceberg. The introduction of SOCPA and anti-terrorism laws have had a profound effect on the policing of protesters and demonstrators in recent years. More recently 114 climate protesters were arrested on “conspiracy to commit aggravated trespass” following a police raid, as usual there were multiple raids on homes whilst people were in custody. The protesters have since been released on bail to return in court in July. With ongoing police operations like this, it is clear to see the worrying extent of surveillance in use by the state and the growing criminalisation of dissent. 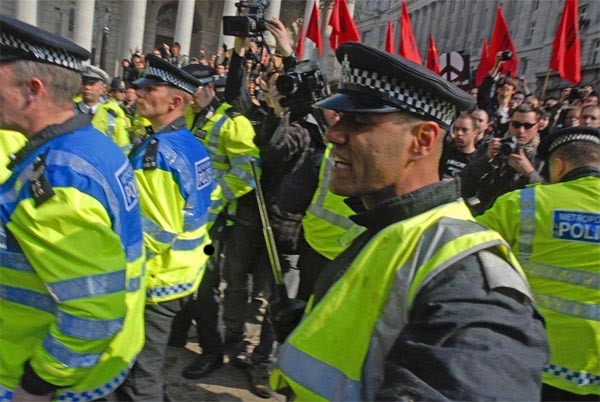 South Wales Anarchists stand against the ever increasing role of the police force as a political tool in the UK, and the violent methods that underlie all police forces. We stand in solidarity with victims of police aggression and those faced with humiliation and deportation due to an over-zealous government desperate for a ‘win’ in the eyes of a sceptical public. We do not simply wish for minimal punishment for the individual officers but recognise that the role of the Police is one of violence, intimidation and protection of power and property. The State monopoly on violence is exercised through the Police and those who defy the moral code of the State will always suffer the brutal consequences.